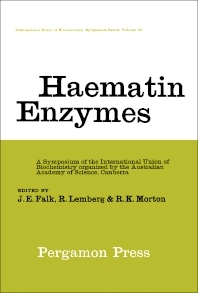 International Union of Biochemistry, Volume 19: Haematin Enzymes, Part 1 provides information pertinent to the fundamental aspects of hematin enzymes. This book covers a variety of topics, including porphyrin complexes, chemical reactions of iron complexes, hemoprotein molecules, metalloporphyrins, and oxyhemoglobins. Organized into 22 chapters, this volume begins with an overview of the relevance of magnetic susceptabilitty and magnetic resonance data. This text then examines studies on electron-transfer processes involving metal ions and shows how the electronic structures of the hem enzymes may be relevant to the types of electron-transfer that can take place. Other chapters consider the implications of the coordination of organic molecules to metal ions. This book presents as well a comparison between known properties and reactions of some simple iron complexes with chelating and conjugated ligands. The final chapter deals with the chemical structures of the prosthetic groups of the cytochromes of type a. This book is a valuable resource for scientists, theorists, and research workers.